The first, planned to be annual, Ozark Mountain Music Festival is scheduled to take place on January 24th through the 26th and hopes to become yet another great music festival to grace the stages of Eureka Springs, AR. Eureka Springs hosts numerous, other popular music festivals throughout the year – Blues, Jazz, Bluegrass – so the edition of another festival to the calendar is a welcome one. 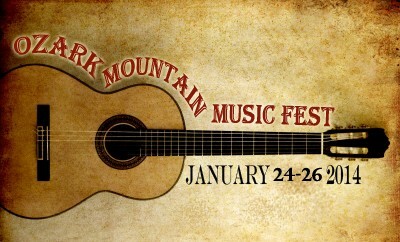 As Eureka Springs is nestled in the heart of the Ozarks so what better place to hold an Ozark Mountain Music Festival? The festival’s focus is on the Bluegrass and Indie-Folk genres so prevalent in the area with an eye on multiple stages providing ticket holders with lively music all weekend long. The best part? The Ozark Mountain Music Festival will be held indoors. It’s great to have a festival of good music to attend in January and even better that it’s indoors. Everyone with me on that? Yeah. Thought so. Other than being indoors, the Ozark Mountain Music Festival will behave much as any other music festival in Eureka Springs with multiple stages and events, food and drink concessions, and dancing all in one, central location. The Ozark Mountain Music Festival will begin Friday, January 24th at 6pm and will continue through Sunday, January 26th with at least eleven bands performing until the Bloody Mary Morning Show on Sunday. While the schedule is still being filled out, regional favorites already on-board are HonkySuckle, 3Penny Acre, National Park Radio, Wink, Pearl Brick, Hogscalders, Still on the Hill, SxRex and Handmade Moments, expect other acts to be added as the date approaches. We’d love to have you at our centrally located, historic bed and breakfast inn for the Ozark Mountain Music Festival. We’re less than a mile from the Basin Park Hotel in downtown Eureka Springs, where the show takes place. Staying here means you get clean, comfortable lodging and a delicious, warm breakfast each morning to start your day off right. Come on and let us show you some true, Ozark hospitality.